Review: Many people know Ernest Hemingway as a famous author who married several times, enjoyed Key West and tragically took his own life. Few know the love story of Hemingway and his first wife, Hadley Richardson. 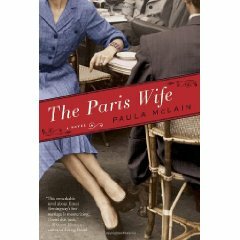 In this fiction novel, McLain tells the story of Hadley, who married Hemingway at age 28 (he was in his early 20's) after a quick romance and their move to Paris in the 20's. Their marriage survives financial woes, an unwanted pregnancy and work stress (at one point Hadley lost all of Ernest's collective works) but cannot survive a mistress (and future wife #2). I am not sure if this book is supposed to be a love story. If so, McLain failed. I never believed Hadley and Ernest to be in love. He seemed to marry her on the rebound (she reminded him of a nurse he was in love with during the war who rejected him) and she was a quiet, depressed woman who needed to escape her living situation. Their entire relationship seemed unhealthy and unbalanced. Upon their move to Paris, Ernest traveled out of town for a job. Hadley became so depressed she couldn't get out of bed. I am not sure why she never got a job or did volunteer work. She lived to serve Ernest and it was disturbing to read. When she accidentally became pregnant (perhaps one of the most disturbing parts is when we find out Ernest tracks her monthly cycles in a journal to ensure they don't get pregnant) she is thrilled that she finally has a purpose in life. That is fine in itself, but it seemed that once she had the baby, the nanny pretty much took care of the kid all the time. They also had a lot of financial troubles but the baby was always looked after. I guess child-care was more affordable in the 20s. I don't know much about Ernest Hemingway's personal life (other than he was married several times), but my interpretation of him from this novel is that he was a manic depressive with narcissistic tendencies as well as an alcoholic. Hadley, as the main character, was written very flat and boring. When her husband moved his mistress essentially in with their family and she didn't leave him immediately, I lost the little respect for her that I had. However, even though I didn't care for Hadley and didn't believe in the 'love' between the two, this book was still overall enjoyable. There are enough side characters (F. Scott Fitzgerald, James Joyce, Ezra Pound) to keep the story moving. I really want to read this book. It looks interesting. I am glad that you enjoyed it. It was great meeting you last night at the signing! Can't wait to see you again.